July 21, 2015 – The 170-year-old distillery in Lawrenceburg, Indiana has gone through many name changes in recent years after being known as the Seagram’s Distillery for many years. Today, it’s known as MGP or MGP Ingredients, and until now, all of the distillery’s recent production has been sold to other whiskey companies for bottling under their own labels. While the very name “MGP” causes some whiskey lovers to have a hissy fit over the lack of transparency practiced by some of the distillery’s customers, there’s generally been little argument over the quality of the whiskey distilled and matured in Lawrenceburg. Greg Metze is MGP’s master distiller, and the distillery’s first retail release under MGP ownership will be known as Metze’s Select Bourbon when it is released in September. In a nod to transparency, the distillery is releasing Metze’s blending formula, with 59% of the blend coming from a 2008 batch of whiskey with a 21% rye mashbill. The rest of the blend was distilled in 2006, with 38% using that same mashbill and 3% using a 36% rye mashbill. 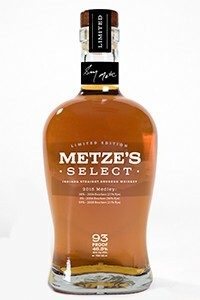 Metze’s Select is being bottled at 46.5% ABV, and 6,000 hand-numbered bottles will be available through the distillery’s distribution deal with Anchor Distilling Co. The whiskey is technically the second released under MGP ownership, following last year’s charity bottling of Mezte’s Medley Indiana straight whiskey as part of Lawrenceburg’s Whiskey City Festival to raise money for the local United Way chapter. That whiskey was not sold on the retail market.